Flavorful and delicious, this vegetable beef soup can be made on the stovetop or in a slow cooker, and any left over soup tastes even better the next day! It’s been ridiculously cold this week, so I decided to make some vegetable beef soup. 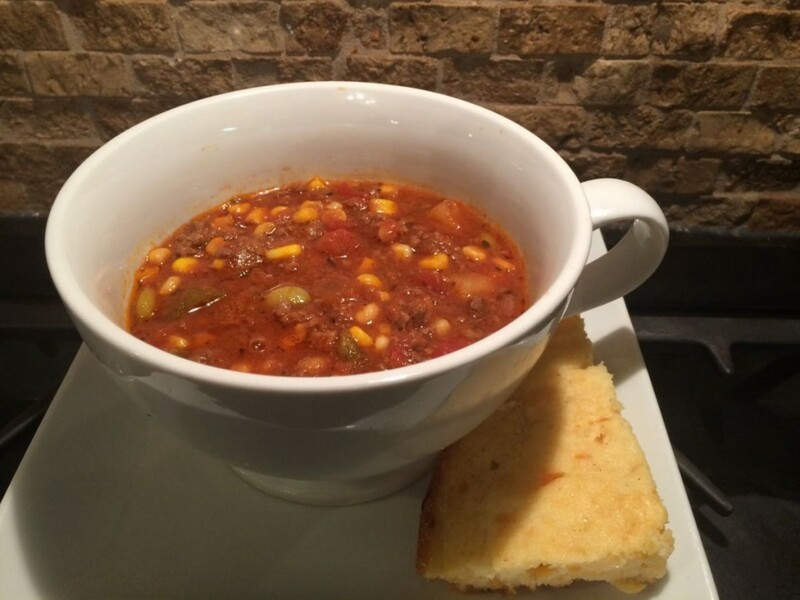 This soup is a “cousin” of my Spicy Hamburger Vegetable Soup but is a bit quicker to throw together and not quite as spicy. Note: I use College Inn Bold Stock tender beef broth, which is recommended by Cook’s Illustrated based on their taste tests. The other recommended beef broth was Rachael Ray Stock-in-a-Box all natural beef flavored broth. The perfect addition to this soup is this JalapeÃ±o Pimento Cheese Cornbread or your favorite cornbread. This keeps well for a day or two in the fridge, and leftovers are just as good or better since flavors have time to meld. Hope you and your family enjoy this! Thanks so much for stopping by. Be blessed, and stay savvy! Savory and delicious, this vegetable beef soup is just what the doctor ordered on a chilly day (or any day for that matter)! Heat EVOO in large skillet or enamel Dutch oven. Brown ground chuck and onion; drain fat. Sprinkle meat mixture with seasonings (salt, pepper, garlic salt, Worcestershire, soy sauce, garlic salt, and Italian seasoning), mixing into meat well. Add all other ingredients, mixing well. Bring to a boil; reduce to a simmer. Simmer on stovetop (or transfer to slow cooker). Simmer on stovetop 1 to 1 1/2 hours. Cook on low in slow cooker 4-5 hours.